While in public preview, Adobe Edge will be a no-charge download that web designers are encouraged to explore and provide feedback on, to help shape future preview releases. The software is available at labs.adobe.com. 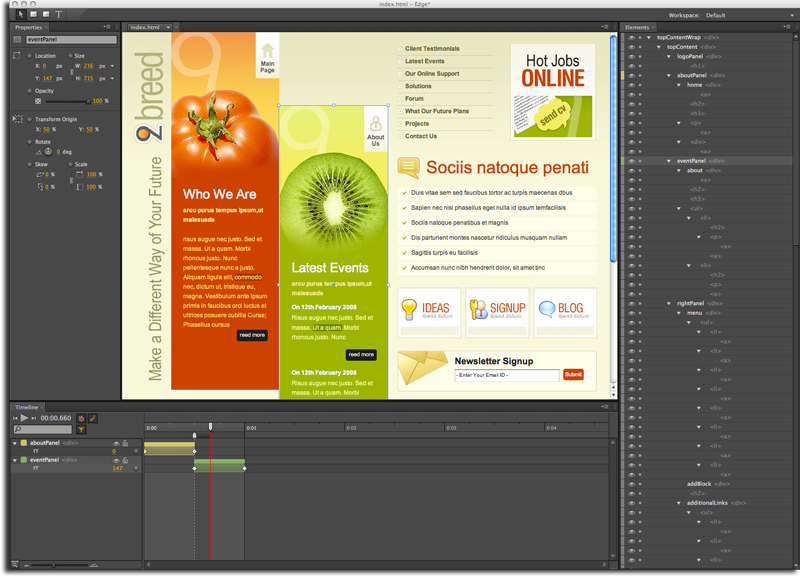 First shown at Adobe MAX 2010, Adobe Edge is portrayed as ideal for designers who want an efficient way to leverage web standards like HTML to create web content with motion and transitions. Adobe Edge is being designed as a fast and lightweight professional-grade tool that complements the company's existing Web tools, such as Adobe Dreamweaver CS5.5, Adobe Flash Professional CS5.5 and Adobe Flash Builder 4.5 software. "Over the last year Adobe has delivered on several significant HTML5 milestones including contributions to jQuery, submitting code to WebKit, and enhanced HTML5 output in Creative Suite 5.5," said Paul Gubbay, vice president of Design and Web Engineering at Adobe. "Now, with Adobe Edge, we're taking our HTML5 tooling to a whole new level and look forward to getting some really useful feedback from the community over the next few months, as we refine the product." The Adobe Edge preview works natively with HTML and enables users to add motion to existing HTML documents without hampering design integrity of CSS-based layouts. It also enables users to easily create visually rich content from scratch, using familiar drawing tools that produce HTML elements styled with CSS3. Users can import standard web graphics assets such as SVG, PNG, JPG and GIF files and style them using CSS3. The design stage utilizes WebKit to enable design, preview and manipulation of content. The timeline feature is both familiar for creative professionals and breaks new ground in animation productivity to enable users to define and customize motion applied to HTML elements with extreme precision. Content created with Edge is designed to work on modern browsers including those on Android, BlackBerry Playbook, iOS , HP webOS and other smartphone mobile devices as well as Firefox, Google Chrome, Safari and Internet Explorer 9. This Adobe Edge public preview is available today on Adobe Labs as a no-charge download for anyone wanting to explore adding motion and animation to their HTML workflow or HTML animation to their skill set. Creative professionals can access the public preview and provide their feedback at labs.adobe.com. 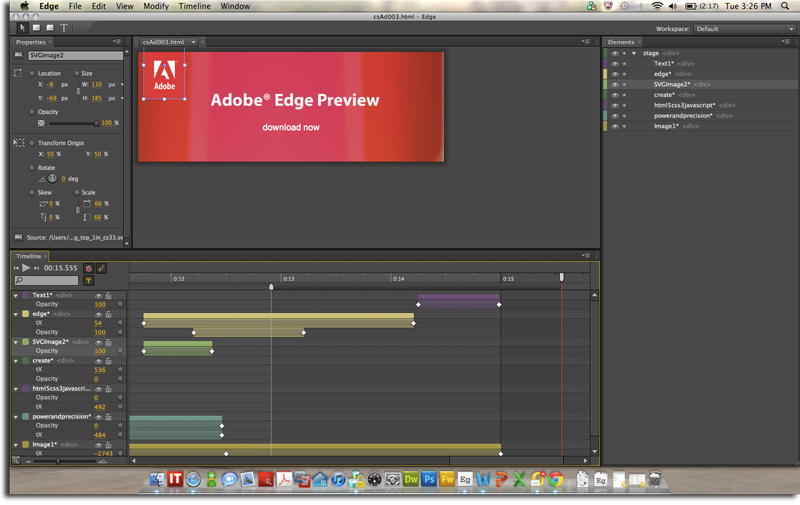 The Adobe Edge preview is expected to be updated regularly as new functionality is added. Users can sign up for email notifications about updates at, Adobe's site.